There are very few experiences more heart-wrenching for a parent than helplessly watching their child suffer. When things looked darkest for Luke Edmunds, Nicole Cloutier was ready to give her son anything he wanted to help ease his pain, even if it meant letting him go. But Luke’s selfless request and amazing recovery gave new hope to his family. After a difficult recovery from strep throat led doctors to investigate further, Luke was referred to Baylor Scott & White McLane Children’s. There he was diagnosed with acute myeloblastic leukemia, a rare and aggressive form of bone marrow cancer which has a survival rate of just 26 percent. He immediately began chemo therapy, the first step in a 200-day journey that would challenge both Luke and his mother. Although she “tried to keep it together for Luke,” Mrs. Cloutier says she was overwhelmed not only with shock and grief, but also with stress and the logistics of being a single mother with a child in the hospital 125 miles from their home in Kyle. How long would they be there? How would she continue to work and provide for Luke? Would she have to drop out of her college courses? How would they get clothes for the next day? 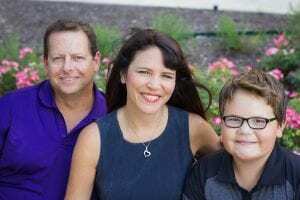 Through it all, friends, family, and the McLane Children’s staff worked to help both mother and son maintain a sense of normalcy. From reminding her to eat and take a break to scheduling procedures around her work, the McLane Children’s staff was there for Mrs. Cloutier so that she could be there for Luke. The staff also recognized that eleven-year-old Luke needed “life outside cancer,” as his mother says. “They balance all the technical and physical care with taking care of the whole child, their soul and feelings and emotions,” she says. 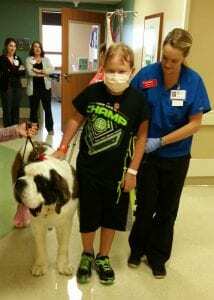 To encourage Luke to focus on other things, the child life team asked him to help walk a visiting therapy dog. 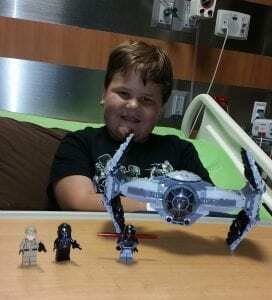 His nurses decorated his room with characters from Star Wars, and even arranged for him to see Star Wars: The Force Awakens during a break in chemo therapy. Because of his weakened immune system, Luke couldn’t be in public and would not have been able to see the film, but McLane Children’s staff surprised him with a private showing at a local theater that nurses sterilized to hospital standards. “They made me feel like I wasn’t going through this,” Luke says. Toy lightsaber in hand, Luke smiled ear to ear in the midst of one of the toughest battles of his life. Unfortunately, things took a turn for the worse. Luke was experiencing severe heart failure, which caused fluids to back up into his lungs. 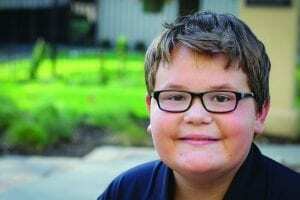 To reduce his fluid retention, Luke could only have a very limited amount of liquid, just two ounces of water in a 24-hour period. Then, on Valentine’s Day, doctors informed his mother that Luke probably wouldn’t survive. Previous post: Happy Birthday McLane Children’s!